The Darien High School Class of 2011 receive their diplomas at the Commencement Exercises in Darien, Conn. on Friday June 17, 2011. Jonathan Greene processes into the auditorium with the Darien High School Class of 2011 at the Commencement Exercises in Darien, Conn. on Friday June 17, 2011. Salutatorian Lindsay Tyler addresses the audience during the Darien High School 2011 Commencement Exercises in Darien, Conn. on Friday June 17, 2011. Valedictorian Charlotte Schaffer address the Darien High School Class of 2011 during the Commencement Exercises in Darien, Conn. on Friday June 17, 2011. 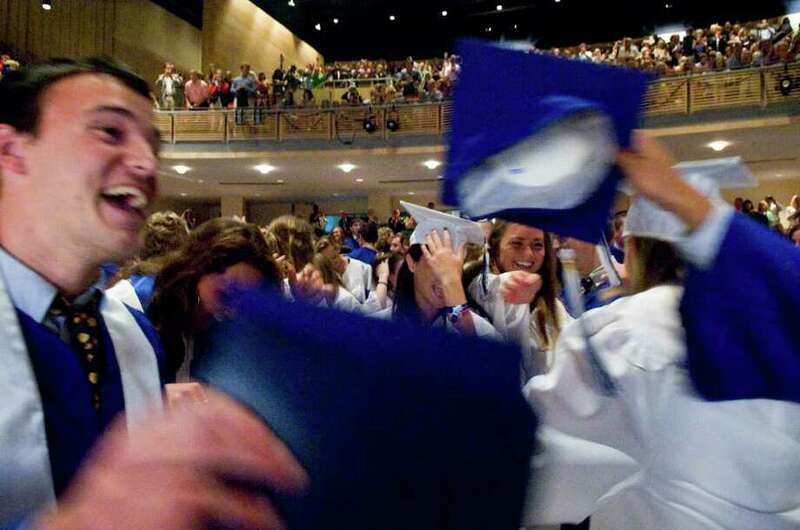 The Darien High School Class of 2011 celebrates after receiving their diplomas at the Commencement Exercises in Darien, Conn. on Friday June 17, 2011. The Darien High School Class of 2011 process into the auditorium for the Commencement Exercises in Darien, Conn. on Friday June 17, 2011. Graduate Elizabeth Leimkuhler sings "This Will Be" during the Darien High School 2011 Commencement Exercises in Darien, Conn. on Friday June 17, 2011. Members of the Darien High School Class of 2011 celebrate after receiving their diplomas at the Commencement Exercises in Darien, Conn. on Friday June 17, 2011. Katherine Matson looks around the auditorium as the graduates process in for the Darien High School 2011 Commencement Exercises in Darien, Conn. on Friday June 17, 2011. Taiga Soejime straightens his robe as he waits with his classmates before the start of the Darien High School 2011 Commencement Exercises in Darien, Conn. on Friday June 17, 2011. Pat D'Agostino, head campus monitor, greets members of the Darien High School Class of 2011 as they arrive for the Commencement Exercises in Darien, Conn. on Friday June 17, 2011. Graduate Nicole Granath, community council president, addresses the audience during the Darien High School 2011 Commencement Exercises in Darien, Conn. on Friday June 17, 2011. The Darien High School Class of 2011 receive their diplomas and place a 'happy face' sticker on Principal Dan Haron at the Commencement Exercises in Darien, Conn. on Friday June 17, 2011. Darien High School Principal Dan Haron announced Wednesday, April 12, 2012, that he will step down at the end of the school year. The Darien High School Class of 2011 placed happy face stickers on Haron, above, at the Commencement Exercises in Darien, Conn. on June 17, 2011.